I write it here and in Marvins Thread. and sometimes raids go wrong by MarvinKosh. I let a Refugee Ape joine my Colony. He was chased by dothraki raiders and a single one turned up to raid. a dothraki on fire, a short snouted bear of one of the animal mods ..
and it did not stop ..
every second another raid was triggered .. Seems so, every other Dothraki encounter seems to work. I can confirm : Normal Raids, Caravan Ambush and Enemy Outpost Quest. Still thank you, for the funniest encounter in B18 so far .. I can upload the savegame or screenshots if you want. Just out of interest, could you list all worktypes Slaves and Maidens are supposed to do, so I know what to expect from them. 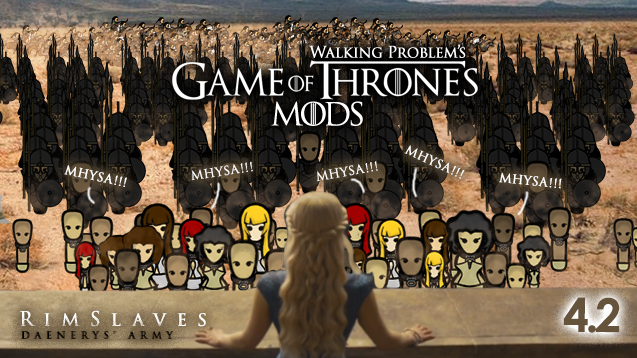 Re: [B18] RIMSLAVES 4.2 : DAENERYS’ ARMY – Game of Thrones mod! RIMSLAVES IS NOW 4.2!! NEW WORK ABILITIES!! An update for the RimSlaves mod together with the launch of the Advanced Animal Frameworks. With the new framework, new work abilities are added to the slaves, like constructing (yes its back), clearing snow, sowing plants (finally! ), tending to wounded, etc… And as mentioned above, the mod will now require Advanced Animal Frameworks as a core mod. – Work Slaves can now Sow Plants, Operate Deep Drill, Construct Furnitures/Structures, Build Roofs, Remove Roofs, Remove Floors, Smooth Floors & Clear Snow. – Maidens can now Tend To Human Injuries, Tend To Animal Injuries, Feed Human Patients, Feed Wounded Animals, Clear Snow, Milk Animals, Shear Animals & Sow Plants. – Some of the work abilities will generate harmless error message on the error log, it doesn’t affect the game. You can disable the auto open of the error log. This is just a "animals" mod - it doesnt really tie with normal prisoners. as for the variant to this mod... I'm considering doing a star wars droids mod... but it might take forever before i get there.... got a lot of mods to work thru before i will even start working on that. Thats still very cool. I havent seen anything else like it, except maybe children and pregnancy, but without the utility all the 'animals' add. Any plans to port something like this for vanilla non established franchises?? Minions runs on the same "engine" as well, although I have yet to update Minions to Advanced Animal Framework yet. Can you make two slavers fight each other in the closed room for a bread? For the punishment of escaping my colony. rotting corpse and bugs without food or clothes until the upcoming spring.